You may not have considered this, but the garage door of your home or business plays a large role in its curb appeal. Industry insiders suggest that a visible garage door makes up approximately 50 percent of a building’s façade. Whether or not you’re style savvy, it’s easy to improve the aesthetics of your property by repairing, upgrading, or replacing the garage door. At American Garage Door, we enjoy helping our clients select a style that reflects their personal tastes and visual preferences. Some people view their garage door as little more than a movable wall to protect the contents inside. With a custom designed garage door from American Garage Door, it can actually become a unique extension of the presentation of your residence or commercial building facility. 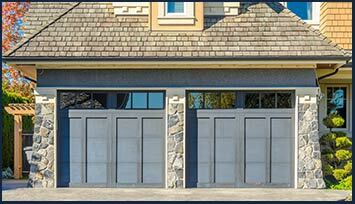 We employ a team of designers who will bring your vision alive with a beautiful and custom-made garage door. Our company uses fine materials such as composites, brushed aluminum, and exotic wood to ensure that the design you choose is highly visible. The American Garage Door designers are passionate about what they do and consider their work an expression of art. Some of the unique customer profiles we can create for you include swing, barn style, overhead, bi-fold, and custom garage doors. No matter which style you select, we offer the same durable construction that we use on non-customized garage door models. The investment you make in a new garage door today will enhance the appearance of your residential or commercial dwelling for many years. American Garage Door is a comprehensive resource for all of your garage door needs. We provide installation, maintenance, repair, custom design, and a host of other services to the home and business owners in our local community. Our steadfast commitment to outstanding quality and quick delivery has allowed us to achieve the status of industry leader. Please contact American Garage Door to request a complimentary in-person consultation for your next garage door improvement project.